Belatedly taking up Cara’s challenge to read a traditional Regency, I picked one up a few weeks ago. It was classic traditional romp, a nice “bon-bon” of a book. I really did enjoy it. Only one thing niggled. Several times in the book it’s stated that it was extremely improper, maybe even scandalous, for pregnant women to be seen in public. Not true! I know, because I’ve researched this subject for articles and workshops as well as my works-in-progress. Being a Regency Research Nerd is a problem sometimes! Of course, I’m not the sort to toss a book over things like this. In fact, it scares me to think there are people out there who would, because who knows what mistakes I’ve made unknowingly, just assuming that something I’d read myself in many other authors’ work was correct? OTOH it also scares me (yes, I admit I’m a bit neurotic) that readers are going to complain that I’ve gotten things wrong. This is what authors notes–and blogs–are for. #1: Respectable women did not appear in public while pregnant. 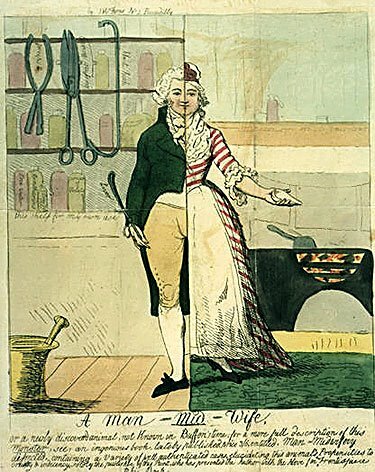 During the Regency and even into early Victorian times, women sometimes stayed in due to health reasons. Or even used ill-health as an excuse to avoid activities they didn’t want to do anyway! But there was no shame about being in public at this time. There’s lots of evidence that many ladies continued an active social life, going to parties, the opera, and even travelling while pregnant. In 1805, Frances, Lady Churchill attended parties in her last trimester of pregnancy. She went to the opera on June 11, and gave birth on June 28. During the last trimester of her first pregnancy in 1810, Harriet, Lady Granville, and her husband visited the country seats of his family members in Staffordshire, Gloucestershire and Cheshire. 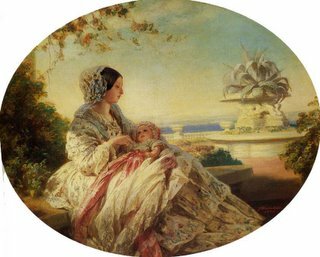 Queen Victoria (pictured above) welcomed Lady Charlotte Guest, who was 6 months pregnant, to a ball at the palace in 1840. Queen Victoria was pregnant herself. Later in history, especially in America, ladies did hide away once they were visibly pregnant. In fact some ladies tightly laced their corsets in an attempt to disguise pregnancy so they could continue normal lives as long as possible. Ugh! #2: Babies were always delivered by doctors. – OR – Babies were always delivered by midwives. During the Regency both midwives and male doctors (those specializing in obstetrics were called man-midwives or accoucheurs) delivered babies. Man-midwives rose in popularity during the 18th century. The picture here depicts the conflict between the new and old ways of doing things. Many thought it was unmanly, immoral and improper for men to deliver babies, but it was the new “scientific” thing. And male practitioners were trained (more or less!) in the use of forceps, while most female midwives were not, so they were theoretically better prepared to deal with problematic deliveries. 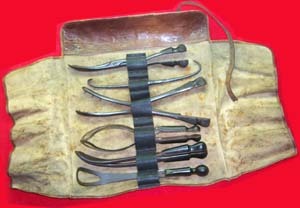 Looking at an obstetric kit c. 1820, though, I can’t help but shudder. By the Regency, most women of the upper classes used an accoucheur while midwives continued to deliver babies for the working class and the poor. So either could work in a story, depending on the setup and the characters. Next week, I’ll deal with a couple more common misconceptions about childbearing in the past. For anyone who is not too squeamish, and who finds this subject even half as interesting as I do, there’s a fascinating (if sometimes gruesome) collect of artifacts to view at Accoucheur’s Antique. There’s also some information and a bibliography on my website. This entry was posted in Regency, Research and tagged accoucheurs, childbirth, midwives, pregnancy. Bookmark the permalink. I am well aware that I too live in a glass house. As a fellow Research Nerd, I can sympathize.